Labels: American Axle, Chrysler, General Motors Corp., Harrah's Entertainment, Quiksilver Inc., Rite Aid Corp, Six Flags, The McClatchy Company, Visteon Corp. 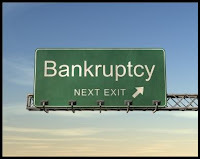 The ongoing recession, which is being seen as the worst since Great Depression, has triggered a wave of corporate bankruptcies. The persistent global economic slowdown threaten to lead to an unprecedented surge in corporate bankruptcy filings in coming days. Companies are poised to default on a record number of corporate bonds and bank loans over the next couple of years. Listed below are few companies that face the highest risk of bankruptcy. 1.American Axle & Manufacturing Holdings Inc.: The Detroit, Michigan-based auto parts manufacturer has been facing challenging condition due to a prolonged slump in auto industry. According to a regulatory filing,in 2008 alone, American Axle got 74 percent of 74 percent of 2008 revenue from GM, which itself is struggling to survive.The company is expected to remain under intense pressure as a couple of days back General Motors announced that it will idle 13 U.S. assembly plants for multiple weeks to trim inventory.Auditors of the company have already warned that it may not be able to continue as a “going concern” because of uncertainty of the survival of GM and Chrysler. 2.Chrysler LLC: The company is teetering on the brink of disaster amid falling sales and mounting losses. Moreover, its most recent bailout plan has been rejected by US government. According to media reports, the US Treasury is pressing the troubled automaker to prepare to file for bankruptcy as early as next week, regardless of whether the troubled automaker ties up with Italy's Fiat before an April 30 deadline. 3.General Motors Corp.: It appears increasingly that the bankruptcy is the only logical solution at GM. Meanwhile, a couple of days back, Wall Street Journal quoted GM's financial chief saying that the auto giant doesn't plan on making a $1 billion debt payment due June 1. 4.Harrah's Entertainment: The ongoing recession has not even spared casino operators. The ailing company has been battling debt amid sinking visitor arrivals. 5.The McClatchy Company: Newspapers in general are feeling heat due to falling ad revenue and are facing mounting losses and heavy debt payments. The Sacramento California-based McClatchy Company, which publishes 28 newspapers including The Miami Herald and The Sacramento Bee, is no exception. The company has received a delisting notice from NYSE, because its market cap and shareholder equity are both below $75 million. 6.Six Flags: The struggling theme park operator has not been really able to get off its own financial roller coaster. The company is facing acute cash crunch and the stock has been already de-listed from the New York Stock Exchange. 7.Rite Aid Corp.: The third largest US drugstore is a potential bankruptcy candidate. Early this month,the company reported that its quarterly loss nearly doubled to $2.3 billion from a year ago. 8.Quiksilver Inc.: The debt -laden manufacturer of surfwear and other boardsport-related equipment finds mention in Moody's list of 283 companies that are most at risk of default. 9.Visteon Corp.: The former affiliate of Ford Motor Co. has been hit hard by a sharp slide in auto sales. Trading in the common stocks of Van Buren Township, Michigan based company has been suspended the New York Stock Exchange. With people no longer being able to use their homes as banks, I am afraid that tens of thousands of smaller businesses will follow. We will be very lucky if unemployment doesn't reach 12% by late 2010. And as soon as the economy does start to improve, the price of oil will go over $100 a barrel. All those Chinese & Indian cars have to run on something. Then comes inflation in 3-5 years. Why do you think Nixon took the USA off the gold standard? He did it so that the Government could inflate the debt away when the baby boomers retire starting in 2010. Unemployment is going to 89%.